can only take your car so far. spaceship has a finite range. 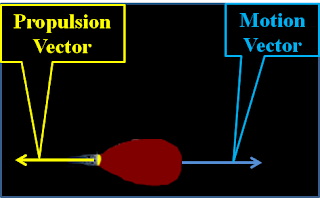 Recall basic principle of rocket propulsion, many high speed particles exit the aft end to form the Propulsion Vector as shown. Thought Experiment (TE) proposes "g-force" propulsion where a specified quantity of charged particles exit aft end at near light speeds. For each second of powered flight, subsequent momentum exchange increases ship's velocity about 10 meters per second (recall that acceleration due to gravity at Earth's surface is about 10 m per second per second (10 m/s²)). Ship's passengers would feel Earth like gravity (Einstein's "Equivalence"), and ship's speed would increase very quickly. Total quantity of particles expelled per second might be on the order of kilograms, and the vessel might be 100,000 metric Tonnes (mTs), about the size of a modern naval, aircraft carrier. This constant particle expulsion will significantly reduce the vessel's mass. If vessel's power system consumed 1 kg/sec, the vessel's Gross Weight (GW) would decrease by 864 mTs for that day. However, the decreasing GW means the fuel consumption is also decreasing. We can determine the g-force vessel's decreasing daily decrement as a percentage. Our thought experiment increases the spaceship's speed 10 m/sec for each second of powered flight. This speed increase approximates g, free fall acceleration near Earth. To get the required momentum from the exhaust particles, ffExh, our thought experiment proposes a particle accelerator as the propulsion system for our notional spaceship. Accelerator brings the particles to relativistic speeds, vExh, which gives exhaust particles extremely high speeds (fractional light speed) as well as increased mass due to relativistic effects. Thus, this notional, accelerating spaceship travels to nearby planets in days, much quicker than the many months required for orbiting spacecraft. Another benefit: constant, consistent acceleration "presses" the spacecraft structure against the passengers, crew and payload to produce the same g-force feeling as if standing on Mother Earth (Einstein's "equivalence"). Thus, g-force powered spaceflight simulates gravity. Ship's propulsion system accelerates a predetermined mass of ionized particles (plasma) to exit vehicle at relativistic speeds. Since these ions come from designated, onboard material, this material fuels the spaceship much like gasoline fuels our automobiles. For both vehicles, when we add fuel, the total gross weight (GW) increases; when fuel transforms into energy to produce motion, fuel is consumed, and Daily Gross Weight (GWDay) ever decreases as vessel consumes fuel. If we know the initial fuel load and the consumption rate; then, we can calculate the time required to consume available fuel, the ship's range. Someday, actual empirical data will determine actual efficiency factors. 2) Marginal Fuel Requirements - it makes sense to plan for "spare fuel"; it's always a good policy to plan the mission to end with some fuel remaining. Since this fuel is not planned for consumption, it might be better to consider marginal fuel as part of ship's infrastructure. Thus, thought experiment disregards spare fuel for computing range of spacecraft. 3) Assume continuous g-force acceleration due to constant particle exhaust; TE calls this "powered flight" in contrast to orbiting, spinning habitats which are traveling in "non-powered flights". TABLE-1 assumes exhaust speed, vExh = 27.3% light speed (c). TABLE-2 assumes greater exhaust speed, vExh = 86.6% c.
TABLE-3 considers several even greater exhaust speeds. Exhaust particle mass, ffExh, will be larger then originally consumed fuel, ffSec, due to relativistic growth. This growth factor can be determined by Lorentz Transform (LT) which determines relativistic mass increase, mr. Exhaust particles with velocity of .27c will grow 4% due to relativity. TE now introduces a new term, Percent Take-Off Gross Weight for first day of powered flight, %TOGWDay1. Simple substitutions and rearrangements give us Equation 4 (Eq-4). %GWDay is daily percent decrease of vessel's GW. used for fuel remains constant. With exhaust particles at 27% light speed (dc = .27), relativism grows exhaust particles by 4% (thus, mr = 1.04). to account for inevitable inefficiencies. Thus, we can conclude that ships Gross Weight (GW) decreases certain percentage for every day of g-force propulsion. This daily difference, Δ, depends on particle's exhaust speed and fuel conversion efficiency. Following show that Δ and logarithms can give us a gracefully model g-force vessel's ever decreasing GW. If ship's initial gross weight (GW0) is 100 metric Tonnes (mT); then, ship will consume 10 mTs of fuel on first day of powered flight. Assume we devote half of ship's mass to fuel; (%TOGW = 50%). Then, ship starts with 50 tons of fuel, and a rate of 10%/day seems to give us 5 days of powered flight. Thus, 5 days can be an initial approximation of ship's range. Fortunately, ship's actual range is slightly better. At beginning of trip, no fuel is consumed. Thus, the initial value of FDay ( = Δ × GW0) is really only good for first day of flight. After the first day, GW decreases due to fuel consumption. Thus, Δ is a dynamic daily percentage value, and it reflects the ever decreasing GW during powered flight. For convenience, let daily decrement be ten percent of ship's Gross Weight (10% = .10). 1st day of trip, fuel consumption; Δ = 10% ×GW0= 10 mT. Thus, GW1 = GW0 - first day's fuel consumption. 2nd day, ship consumes 10% of GW1; Δ = 10% ×90 mT = 9 mT. Thus, 2nd day's fuel consumption is less then 1st day's. Furthermore, GW at end of day 2 (GW2) is less than GW1 at end of day 1. 3rd day, fuel consumption will be even less and so on as shown in following table. To determine ship's gross weight (GW) for any given day "t" (GWt), multiply original quantity (GWo), by initial daily decrement "(1-Δ)" raised to the power "t". We see that exponentials can readily approximate fuel consumption. Any inexpensive scientific calculator has an exponent function; thus, we can readily calculate numerous guesses as to how many days is required to reduce ship's original gross weight (GW0) by 50%.Our initial intuituive guess was 5 days; recall it seemed that 50 mTs divided by 1- mT/day might give us 5 days of powered flight. However, our guess fails to consider that ship's GW decrements by percent not by absolute weight. Consider that as fuel is consumed, GW declines; a lesser GW needs less fuel to propel it, and this cycle continues throughout powered flight (as shown by above table). Thus, mass of fuel consumed decreases throughout flight even though the percentage of GWDay remains the same. A quick exponential calculation shows that 5 days of 10% consumption only reduces ship's gross weight to about 60% GW0. to eventually determine a t value for a GW near 50%. Thus, a daily difference (Δ) of 10%/day gives our notional spaceship a range of about 6 and a half days of powered flight. Use logarithms to readily compute accurate ranges. What if at = b, where a and b are known, but t is unknown? Daily Decrement: Δ = 10%; thus, 1-Δ= .90. Thus, logarithms can quickly approximate ranges for different values of %TOGW. then, g-force fuel consumption = 10% GW per day = Δ (daily difference). Range (RDays) is total days of completed flight time. Gross Weight (GWt) is ship's gross weight (GW) after t days of flight. Original Gross Weight (GW0) is ship's gross weight after zero days of flight. It includes ship structure, payload, passengers, crew and original fuel, F0. F0 , is fuel mass needed to power spacecraft through entire flight. This includes departure leg & return leg. Since spare fuel is not planned to burn, TE considers it part of the ship's infrastructure and not part of F0. Thus, TABLE-2 deletes these columns and lists relevant values only once in header. is the amount of fuel required for entire mission. This value is expressed as a percentage of the vessels' initial gross weight, GW0. Final Gross Weight (GWFin) is remaining gross weight after fuel depletion. GWFin can be expressed as a percentage of GW0. is percentage amount that ship's GW decreases per day. Efficiency Factor (ε) helps account for design flaws and peripheral power needs. Δ is expressed as percentage of gross weight, GW. is total days of powered flight available from original fuel load. Following four phases of interplanetary travel must fit within. Acceleration Time: Let tAcc = time to accelerate from departure to half the distance to destination (midway). We assume continuous g-force from start to midway. Example: Diagram shows all phases with 1 day duration. However, phases can be determined for any interplanetary distance (1 to 100 AU). Phase I: g-force spaceship accelerates at g from Earth to half the distance (d/2) to the destination. Let tAcc and dAcc, be time and distance (respectively) from start of acceleration until stop of acceleration. Thus, d/2 = dAcc . Return Leg also has two equal phases. Thought Experiment (TE) assumes Return Leg distance (d) to be same distance as Departure Leg. Phase III: Accelerate back from destination to midpoint; distance/time will be same as for Phase I. Phase IV: Decelerate from midpoint back to Earth. Distance/time is same as for other phases. We've already determined range based on original fuel load, F0, (possible range in time (days) from %TOGW and GWFin; see above table). doubles mass of exhaust particles (ffExh = 2 × ffsec) to greatly expand spaceship's range. Common sense compels us to continue assuming painful but practical efficiency factor, ε = .1. Time will tell, but for now, TE assumes that for every 100 ffsec particles consumed, only 10 actually become effective propulsion particles (ffExh). Thus, we must consume ten times more ffsec than we'd otherwise expect. Thus, spaceship attains: 864 km/sec in one day, 1,728 km/sec after two days, etc. where t = time in days. Slowdown is required for both legs of journey: departure and return. This is described in TABLE-2. Particle Exhaust Speed: dc × c = 86.6% Light Speed. Relativistic Exhaust Speed Doubles Mass: mr =2. Current particle accelerators now accelerate particles to velocities faster then .99c; thus, it's very likely that we'll eventually design propulsion systems to accelerate particles much faster then .866c. Thus, daily fuel consumption will decrease, and range will increase. Consider following points. ffsec For every second of flight, our notional spaceship consumes an ever decreasing quantity of "at rest" fuel which we'll call fuel flow per sec (ffsec). This is the fuel's mass prior to conversion to plasma (ions, particles with charges). Thus, fuel consumption is reckoned in terms of fuel at rest "ffsec" at zero velocity in relation to ship. ffExh For every second of flight, a particle accelerator uses a system of magnetic and electrical fields to accelerate these charged particles to large fraction of light speed. A century of particle accelerator experience confirms that ions grow as they accelerate to near light speed; thus, the consumed quantity of particles (ffsec) transform to an increased quantity ffExh, fuel flow of exhaust particles. Collective exhaust particle momentum (near light speed velocity times relativistic mass) enables spaceship's propulsion. Determine Acceleration Distance. Once we determine acceleration time, tAcc, from one fourth of the practical range (see previous work); then, we can determine acceleration distance, dAcc, as shown below. Departure Distance. Determine total distance for departure leg by multiplying by 2 because deceleration distance equals acceleration distance, dDec = dAcc. This was previously discussed in Table-2. 100% Efficiency is impossible for following reasons. We must artificially assume every single particle makes it all the way through the many kilometers of waveguides and exits spacecraft exhaust as intended. Furthermore, we must incorrectly assume no additional energy is required for other energy requirements, such as electro-magnetic fields to guide the particles. Add columns to cover increasing relativistic growth factors and associated speeds. This table uses a constant final gross weight (GWFin) of 50% of original GW. mr is relativistic growth factor computed from Lorentz Transform. ε is an Efficiency Factor introduced to assure practicality of fuel requirements. All we now know is that fuel flow efficiency will start out much less than 100%, and it will improve over time. For convenience, Thought Experiment assumes an efficiency of 10%; thus, ε = 10. Δ is the amount of at rest fuel consumed for each day's propulsion, expressed as a percentage of ship's gross weight. %GWFin is the final gross weight of the spacecraft after the original fuel load fuel (%TOGW) is consumed. %GWFin is expressed as a percent of original ship's mass and can be computed: 100% -%TOGW. Above (Table-3) uses a constant %GWFin of 50%. t is total time from F0; this capacity is the range. d is total distance for departure leg. Note that this table only uses half the planned fuel for departure leg; other half is for return leg. Good News After g-force spaceships can accelerate exhaust particles to 98% c; then 50% TOGW spaceflight profiles will have capability to accelerate for 30 days then decelerate for another 30 days to travel about 451 AUs. More Bad News Thus, it follows that we've only traveled a tiny fraction of the distance to our nearest stellar neighbor, Alpha Centauri, about 4 LYs away. vFin limitation (can't exceed c) - There is a physical limit on spacecraft speed; it can't exceed light speed. This doesn't limit time of acceleration, but it does mean a more accurate model needs us to compute resulting spacecraft velocity in a different way. After a certain point, incremental increases in acceleration time can no longer be modeled by a corresponding linear increase in spacecraft velocity. Above items are discussed in more detail in Volume 3, Interstellar. In 1908, Rutherford was awarded Nobel Prize for Chemistry. Term "half life" means a duration for which a certain substance declines by 50%. where Δ is % difference in mass per second and the t is time in seconds. For example, how much time (in seconds) to decay to 10% of original?